In new Go iLawn and Go iPave, the “Pointer” icon is very important. Not only does it allow you to move the map around by clicking and dragging the background image; it is also your access point for the various editing functions we’ve built into our new software. Once you’ve created one or more drawings (Areas, Distances, or Counts) in your project, select your “Pointer” tool by clicking on it. Look for the arrow icon at the top of the toolbar. Once you’ve selected the Pointer, simply click on any existing drawing to start editing. At top is the Name [Asphalt-1] of the drawing. Click there to change the name. Below the name is the Measurement. In “Area” drawings, this defaults of square footage [72,160.41 ft²]. Edit Shape – Allows you to move the whole shape, stretch it, or rotate it. Cutout Area – Lets you draw an area inside the shape to remove it. Use it to remove mulch beds from your lawn size or islands from a parking lot. 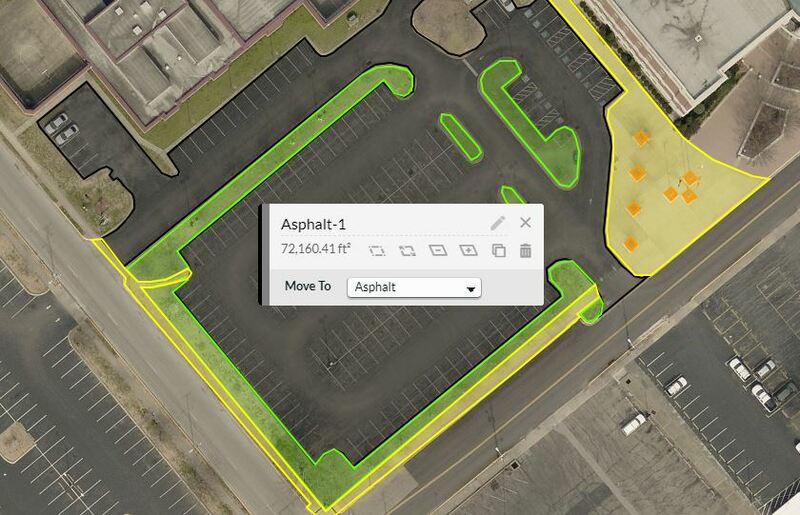 Add Area – Lets you draw more areas to add to the existing shape. Great for bigger edits or adding something you forgot the first time. Duplicate Shape – Copies the selected shape, so you don’t have to manually draw identical shapes. Delete – When all else fails, you can just remove the shape and start over again. At bottom is the “Move To” command, which lets you move this drawing to any existing group. And remember, when using any of our drawing and editing tools, keep your eye on the Drawing Tool Tips box at the bottom left of your picture for tips on what to do next and handy buttons to Complete, Cancel, or Stop what you’re doing. What other Tool Tips would you like to see? Let us know in the Comments!